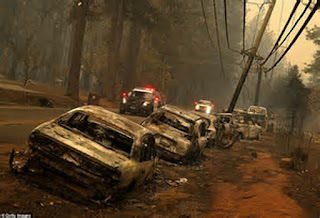 In the deadly aftermath of the Camp Fire which destroy the Town of Paradise, Writer Christopher D. LeGras reports on the fatal consequences of a recently-installed "Road Diet" in the town that was contrary to the need for more highway evacuation capacity, as noted in a 2008 Butte County Grand Jury Investigation. Line of burnt cars along a Single Lane Evacuation Route in Paradise California. ** Blogger's Note: In a Mayor Sam Exclusive, we present the following missive via Writer Christopher D. LeGras, who discloses the fatal consequences of the destroyed Town of Paradise's decision to install a Vision Zero-Type Road Diet along its primary traffic artery. Like the recent Sunland Tujunga Brush Fires, Road Diet constrictions caused life-threatening issues with the speedy flow of evacuees out of the danger areas. As more municipalities ponder Road Diets in their respective areas, they we be advise to read the following ..........., and reconsider after the lessons of the Camp Fire, are truly vetted----Scott Johnson. As the Humboldt Fire ravaged Butte County in 2008 evacuations out of the communities of Paradise and Magalia bogged down in gridlock. Fleeing residents were trapped in their cars, flames boiling on both sides of the road. Many fled on foot, barely escaping with their lives. Butte County is wildfire country, mountainous terrain where the next conflagration isn’t a matter of if but when. When the fires come the lives of a quarter million people depend on evacuating along an extremely limited road and highway network in which every square foot of space becomes critical. Instead, in 2012 the county decided to narrow Skyway. It removed traffic lanes and installed bike lanes, bulb-outs, and other traffic calming measures throughout Paradise. See these before and after pictures. This is how ideology defeats common sense and costs lives. For the grand jury’s report was prophetic: The lack of adequate shoulder space to park disabled or abandoned cars contributed gridlock so severe that people abandoned their cars by the thousands and fled on foot. Many of them didn’t make it. According to Paradise resident Chuck Kessler, the narrowed roads contributed to the horrific gridlock that turned the evacuation into a death march. And Paradise evacuee Jennifer Morris said it took her and her two children more than five hours to escape. Similar stories abound in evacuation centers. Vision Zero Foothill Blvd Evacuation Choke Point. The communities are nestled in a two mile wide canyon bordered by the 4,000 foot Verdugo Mountains in the west and the 8,000 foot San Gabriels in the east and northeast. Southbound evacuations usually are the only safe option, and Foothill Boulevard often is the only option. Yet the city installed physical barriers in the form of bollards – narrow plastic tubes with metal bases that anchor into slots in the pavement – that are a cheap means of blocking off lanes. Even as the magnitude of the danger became apparent the city refused to remove the bollards and open the additional lanes. Miraculously, unlike northern California this month, no one died. When contacted for this story, the captain of Station 74 in Sunland said, “No comment,” and hung up. Captain Harry Holtz of the Oakland Fire Department said that a road diet on Telegraph Avenue – another major thoroughfare and evacuation route – at times forces his drivers to resort to what they grimly call “suicide mode,” driving down the opposite side of the street. 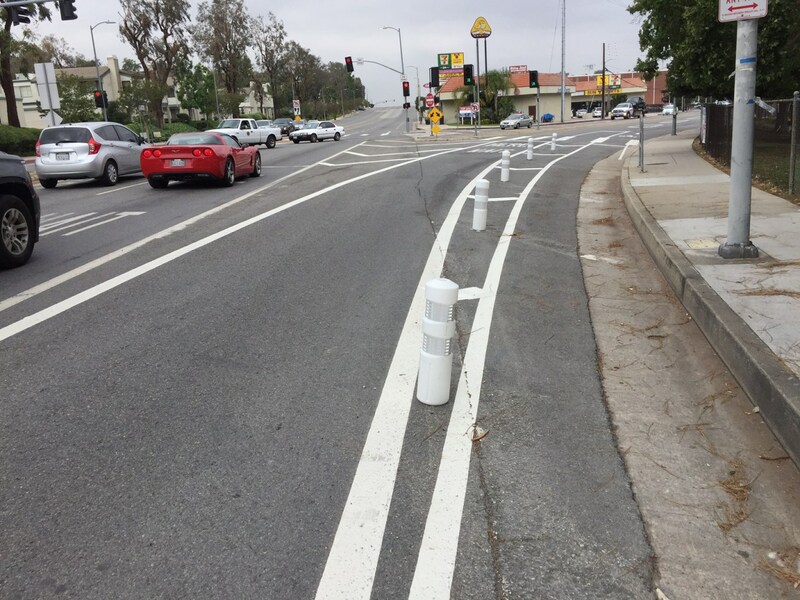 Despite mounting evidence of serious public safety hazards cities and counties around California continue to install thousands of road diets. Ms. Grant asks, “How many people have to die before they stop?” Tragically, the answer may lie in Paradise.